There’s no denying that Tokyo is a paradise for foodies. The city is often referred as the culinary capital and continues to boast the highest number of Michelin-starred restaurants in the world — a total of 230 compared with second-place Paris’ 118. But having lived (and gloriously stuffed my face) in Japan’s capital for the last three years, there’s one food experience I miss from my home in L.A. I really miss throwing dinner parties for friends and I miss going to them as well. There’s just something about being in the comfort of a home, relaxing, eating, and talking without feeling rushed like you sometimes can when eating out. For me, having an authentic home-cooked Japanese meal with local people can be an experience unmatched by any restaurant— however many Michelin stars it might have. 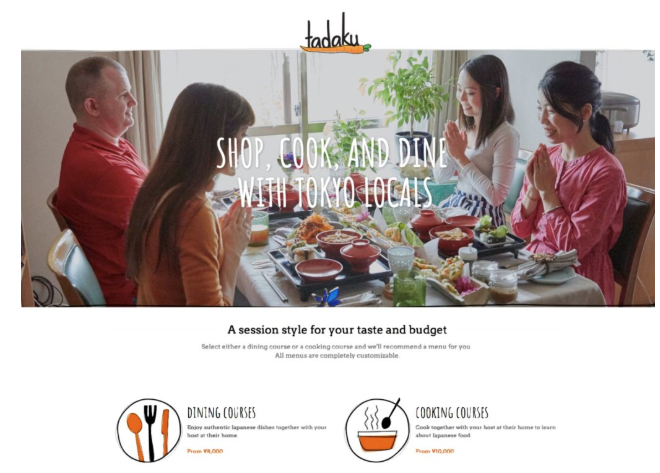 Happily, I recently got the chance to experience a new service called “Tadaku — with locals,” a platform that offers both cooking classes and ready-made home dining experiences at Japanese homes. You can learn how to cook Japanese recipes or attend your own ready-made dinner party. Both the cooking course and dinner party courses are run by a community of local foodies keen to share their expertise and love of Japanese food with foreign guests. Both also include casual and fancy options. The casual options include a random group of four to six guests while the fancy options are private. Once you’ve picked the course, you have to fill out a detailed questionnaire allowing them to match you with the perfect host. They’ll ask a variety of things, including what kind of foods you want to try. You also get to mention your budget and what you are looking to get out of the experience to ensure you get exactly what you want. More eager to experience a Japanese dinner party than learn recipes, I chose the second option. One feature that really appealed to me about the service is that they choose a host according to your specific dietary preferences and restrictions, as well as other needs you disclose in the questionnaire. As someone who values organic local produce, I was matched with Aya, a lovely lady who has experience cooking organic Japanese food and was also an experienced pastry chef. My biggest tip for hosting an authentic Japanese dinner party would be to ignore those who say it's not authentic without them saying so (and in some cases insist you use ingrédients from A region, and get a license from B). Now, if you want to go experience one, once again, it does not mean it need be limited to a Japanese family; I know plenty of expats who serve more authentic Japanese fare, in an authentic, traditional Japanese way, than most Japanese I know. Some will automatically disagree, but just shop around for the right person, Japanese or not, and have fun. A foreigner telling people how to do things the Japanese way? Actually, you book a restaurant. It's the rare Japanese person who entertains a roomful of invited guests at home. Sometimes I just can’t understand this obsession some foreigners have with copying or trying to imitate the Japanese way! Noted that there are certain good things that Japanese people are good with but some foreigners are just crazy as they get overly excited about these. They must have been living in a bubble back in their country and never experienced the wonders of life. No need for foreigners to host these kinds of parties the Japanese way... just do it your own way and the Japanese friends will appreciate it anyways!!! Ditto to @expat and @MikeH’s posts. I would read it with some interest if it were a Japanese writer, but these quasi cultural appropriation “here’s how it’s done” articles only fool the recent arrivals to Japan. It did provide some sad comic relief though.